Now, I’m not a big fan of “State of” kinds of speeches. Most times they leave me with a feeling of “Now, that was some BS I could have spared myself.” But it was a joy the other night listening to Richard Barrera, the President of the San Diego City Schools Board of Education, share his thoughts on schools being community based in a refreshing non-preachy conversational tone as opposed to the usual empty tome that politicians usually read verbatim at such occasions in coma inducing tones. His rap resonated with me because as an educator I can say, from having been “part of” creating some fairly dynamic learning environments in my time, that it can’t be done with out tons of input from the “hood.” I mean what is the purpose of education if not to empower communities, the stakeholders? Richard talked about making education relevant to learners’ lives and I had to give a high five to that notion because I’ve also discovered over the years that if a lesson isn’t relevant it most likely isn’t a lesson – it’s more like knowing the Month day and year when Lewis And Clark set out on their expedition but having no clue who Lewis and Clark were or what an expedition is, causing you to wonder: what does this have to do with me? Rarely does someone speak to my heart and validate my educational thoughts and philosophies as Richard did that night. I drove home feeling so mellow, so hopeful, and then a picture that had been blotted out by Richard’s powerful presentation surfaced in my mind: a picture of two members of a JROTC Color Guard, marching crisply and sharply and “presenting arms” before a young girl ingrained herself in our hearts with her rendition of the National Anthem. But the image of teenagers with guns, whether they’re gang bangers or someone aspiring to become an Army of One, just doesn’t sit well with me. It’s so unnecessary and primitive and it makes our “no excuses, no exceptions” Zero Tolerance Laws against weapons in our schools ring ever so hollow. Makes no sense to me how we can get so energized over things like test scores and class size and barely blink an eye as military recruiters hang out at our schools with our children shooting the breeze almost whenever they please. What prevents us from asking school officials “Now, why do we have JROTC?” We just go along with the tale that it isn’t really about encouraging our children to become the Few or the Proud as much as it’s about teaching them discipline – while the Department of Defense hails it as “one of the best recruitment programs we could have.” And what does snapping to, just because somebody says to, really have to do with discipline? And is this what our children need if they’re to grow up and turn this rascal of a world around? But we, as a community, when it comes to the militarization of our children, should look into removing as many symbols of war as we can from our schools because, even if we believe in war and the like, we have to know that the wars in which our country is involved presently are illegal to the core. There’s no international law that allows a country to just go off somewhere and depose the leader of another country, no matter that he’s a horrible human being like Saddam Hussein. And searching caves and chasing thugs down in billion dollar SWAT operations, well, is that something thousands of our teenagers and other young adult sons and daughters should be doing? Nothing would be more relevant to our children’s education than us grownups looking at our world closely and creating learning experiences that inspire them to think creatively, critically and multi-culturally which is a stark contrast to what the military instills in their psyches. And I throw in helping them think “artistically” as the icing on the cake. The arts should be at the center of our children’s education because it’s through the arts that they best get insights into their own thinking and therefore discover who they are and what they have to offer the world – that pretty much is what it’s all about. Any community that thinks like that will find that what they create for their children will not only be academically sound but also enriching for their souls, not to mention tons of fun for everyone. I know. As an educator that’s pretty much what I’ve done. All I can say is WOW! A voice of sanity in this seemingly insane world! Thank you Ernie. It brought back so many memories, as in when my David was 2 yrs old, some 38 yrs ago, and I read “Summerhill”. A year later getting involved with the O.B. Free School; teaching kids through experience and community. i.e. Taking the kids to the court house for the trials of some of our friends who were charged with civil disobedience for “Stop the War’ activities, (civics), helping at the O.B. People’s Food Store, (nutrition, math), P.E. at Robb Field and the beach…. Music, Arts, hands on. Zero tolerance laws are always hollow and idiotic anyway. Teenagers shooting at paper targets are not the cause of wars, or a cause for worry. It’s when they’re shooting at humans that there’s a problem. I was target shooting at 12, and I’m hardly a militarist or anything close. One thing to keep in mind, JROTC does not obligate one for military service. It is simply a class and there is no obligation to join the actual military. 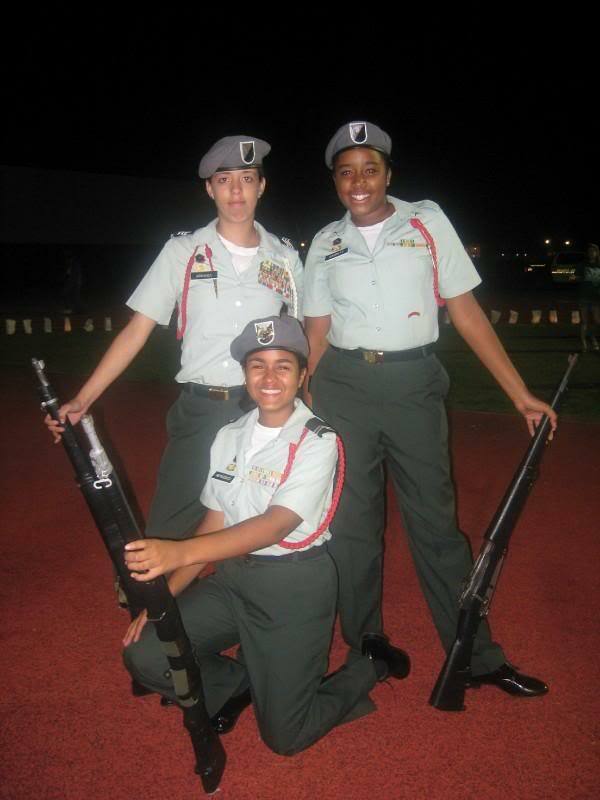 Most people that I know who went though JROTC never actually went in and had no interest in doing so. Whether or not high schools should have the program I have no real opinion about one way or the other. Mine didn’t and if it did, you would not have been able to pay me to take the class. I would have wanted nothing to do with it and I probably would have made fun of the kids who did. Ironically I DID end up enlisting in the Navy at 24 and made a 20 year career out of it. If my school had a JROTC program and my parents would have made me take the class then I doubt I would have had any interest in joining the real military later. I will take a gamble and guess that most of these kids are the same way. A few will but most won’t. I was in High School while the war was still going in Vietnam, and I knew almost nothing about the History of the area. Our textbooks were outdated. Plus our world and US History classes were taught on a timeline format. The school year was in its final week when we reached the current decades. Vietnam was sort of a don’t ask and don’t tell topic. My education didn’t prepare me to make that important decision whether or not to enlist. Do we do any better today? Are young people given the information they need to make that decision? The average student, not just the handfull that get into special classes. My feeling is, and has always been, the military is about the most serious undertaking anybody can sign on to. Kids have to be given the lowdown from the very beginning with no BS attached at all. I’ve always told kids who wanted to join that it isn’t a job like any other, you can’t one day say, “This isn’t for me,” and walk away. It’s a commitment not to be taken lightly at all. Again, it’s about honesty, about being upfront, about letting them know that they might go to war. How many times have we heard some teenage warrior say “Well, I was just trying to get some money for college” with seemingly no clue that they might be in harm’s way. I don’t think we’ve needed any kids to come to the aid of our country since World War II and if our country had been more interested in what was going on around the world before Hitler and Mussolini and Pearl Harbor there would have been no threat of our national tongue being Japanese or German. And it would be nice if we discussed the ins and outs of the wars with students if we’re going to have programs like JROTC. When you and I were at Tucson High breathing hard every time Candy Damato walked by (smile) it was like World War II had never happened and the Civil War had just gone down. My point is I am totally against jiving kids and keeping them in the dark. They’re bright and energetic and need to know the real deal in plain Ingles. And it’s great being in print together here, amigo. Points well taken Ernie…. I could not agree more about making sure these young buckaroos are well informed… on all sides of the issues… But for some, like yours truly, the military provided a jolt of reality that was sorely needed for a lad that had spent more time tinkering on cars and thinking about girls than hitting the books at Tucson High…. Besides getting valuable training, that has served me well all my work life, the military also taught me self discipline and self confidence that has enabled me to function as a productive citizen all the rest of my life… And the seed was planted in ROTC at your Alma Mater…U of A. Might as well jump in here. Sure, country’s actually in danger, I can’t be a pacifist. Would like to, but just can’t do it. Country’s being lied to, led by the nose, hoodwinked, I would not go again. However bad a leader or an established authority may be (remember Idi Amin? South Africa? ), I don’t see it as our (the USA) job, mandate, or duty to go about the planet creating democracies through the barrel of a gun. It is my impression that might does not make right. It gets obedience, but not allegiance. I will obey while you are watching and threatening me, if I know the threats are real and represent a price I am not willing to pay, but don’t turn your back. You’ll get shot in it. How can we measure such things? Saddam was, by all accounts, not a very good guy. Iraq probably wasn’t all it could be while he was at the helm, but how does that measure up to what it has been since the then Commander in Chief declared the job was done? How many have died? How many will? I can’t see Iraq as a success or a job well done. Afghanistan? Well, in the immediate aftermath of 911, the Taliban said, according to what I know and in so many words: “Yeah. He’s here. No. You can’t have him.” I’m in favor of going to get him, in those circumstances. War as a reality check? It certainly is. Yes, it did change my life. Skills useful for a lifetime? Don’t know. Could have been a member of Patco, but I would not work for the federal government again. Could have gone back to the BofA, but didn’t want to work for them either. Some value in the experience? Tons of good people. The end of innocence. The GI Bill; a BA. A VA loan. Convertible life insurance; not for me. Self discipline and confidence? It tore me up emotionally. That lasted at least five years. If not for a few people that I loved and that I knew loved me, I’d have been dead. And the country, in the form of organized authority, was no help at all. So, one on one, okay, we can talk. As a group? That’s still hard for me. The military on campus? BS. Quit waving that flag. JMW – thanks for the heartfelt thoughts, I know you had to dig deep for them, but it’s good to let them out once in a while. We must keep that top CIA list of Hitlers in the FAKE war on terror in the news. You notice the media accepts the government version of this guy without question. After all the media never questioned the many plastic VCR tapes found in bombed out buildings in Afghanistan. The ones showing Osama Bin Laden confessing that he planned 9/11/01. Of course since their very expensive wedding in Dubai to the Military Industrial Complex, BIG CORPORATE MEDIA has been the KEY to the success of the FAKE war on terror. Big name reporters doing VIETNAM style reporting of Gulf War one would have put a serious crimp in the planning of the two pending Cheney/Rummy/Blair CRUSADES. Thanks to the marriage, the planning of the New Pearl Harbor could move ahead with no problems MEDIA wise. So what could be done to drive the American people into such a hate filled rage as to allow the invasion of TWO innocent countries. Two countries that just happen to have two of the most sought after and profitable resources on earth. Heroin and oil. Next of course the planners, being super rich business guys wanted this to be a long term financial success. This could not be just a quick world super power VS two countries with no real military power QUICK bomb and kill and get out war. The new Rummy private contractor military owners wanted that money to flow for years. Why don’t we look at the 60 year old Israeli/Palestinian successful adventure in MONEY, a super rich guy said. Good idea, call the CIA, see if they can dummy up a fake Hitler and a fake army. We can call them evil terror dudes. This should be a piece of cake. It will be easy to build hate in the western world for Muslims. Most important make sure every guy involved on anti American side of 9/11/01 is a MUSLIM MAN. Then round up a bunch of Muslim men, don’t be bothered by anything as silly as human rights. Throw the Muslim men in prison, torture them, claim they confessed to every evil deed in the history of mankind. So congratulations to that bunch of super rich guys for a money making adventure in pure greed. The FAKE WAR ON TERROR ROLLS ON. Thanks to a never ending supply of Muslim men, this could end up far exceeding the 100 year war. Just remember the most important marriage vow, make sure the MEDIA BRIDE gets her cut. Or this could be the most ghastly DIVORCE in world history.